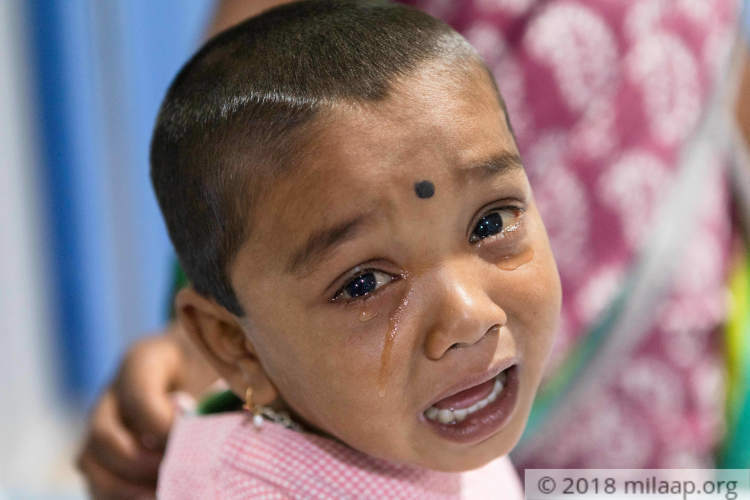 “Manikanta's stomach is severely swollen and he scratches his body constantly even though it's painful. He still can't walk, but his mind is active. He remembers everyone he meets – he knows all their names and faces. Only, he is too young to remember that he is slowly dying.” – Buggaiah. Chandrakala tries to put her 2-year-old son to sleep but he cries the second she puts him on he hospital bed. His bloated stomach is giving him so much pain that he cannot eat or sleep. 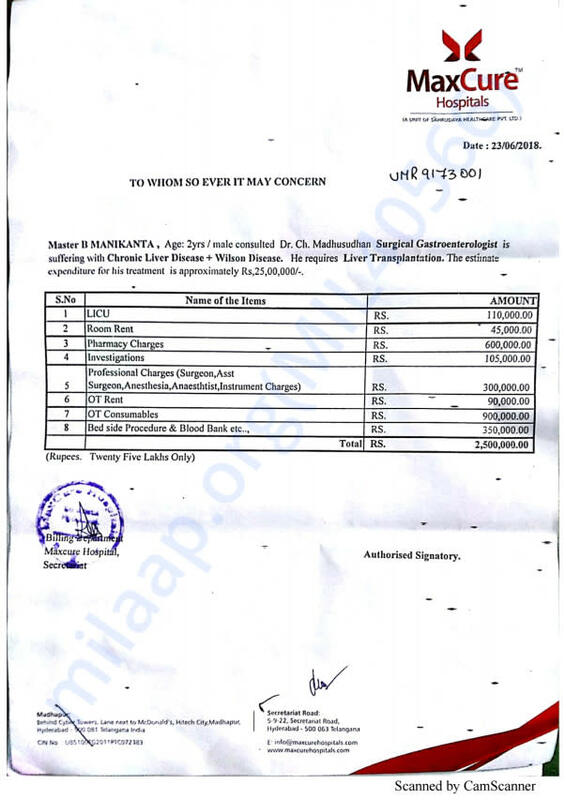 Manikanta is suffering from a liver disease and needs an urgent transplant. He is only alive due to medical support but that is soon going to change as his parents have run out of money to keep him alive. Buggaiah and his wife Chandrakala are daily-wage workers. Most of their income is from working for government employment guarantee schemes. They had a child almost a decade after their marriage. Unfortunately, their two-year-old son has a damaged liver and he needs an immediate transplant that his parents can't afford. Manikanta's parents were thrilled at his birth. But his life was in danger within a month. Manikanta has Wilson's Disease, a condition where the body is unable to eliminate copper from the body. Liver is one the first organs affected by this condition and by the time he was 2-months-old, his liver was damaged beyond repair. With medical support, he lived for two years, but he has very less time left. "We prayed for years to have this child. If something happens, let it happen to me. I want my innocent baby to live. I can't bear to see him going through so much of pain. 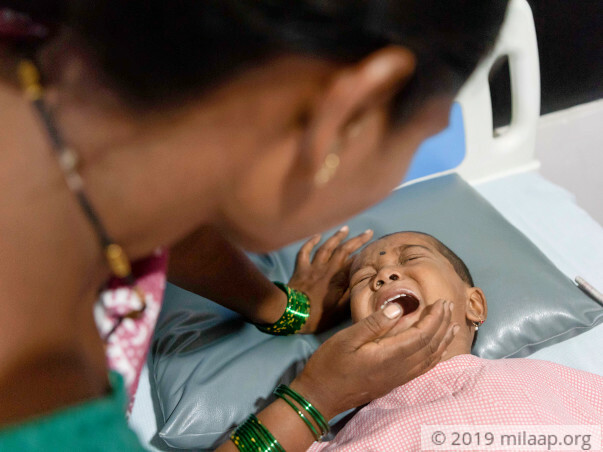 As a mother, I feel terrible because I cannot do anything to ease away his pain.” - Chandrakala. Once the sun sets, the world becomes dark to little Manikanta. His illness makes him tired, weak and prone to dangerous scratching. But it is taking away his eyesight too. His parents are desperately trying to find a way to save him before it is too late. They are helpless in the face of how expensive it will be to save their son. “You can imagine how it is for us labourers. We earn only when we get money. Both me and my wife work to make ends meet. We earn about Rs 200-400 if we find work for that day. We have managed till now only because of government support. Twenty Five lakhs is something I can't manage even if I work for 50 years.” – Buggaiah. 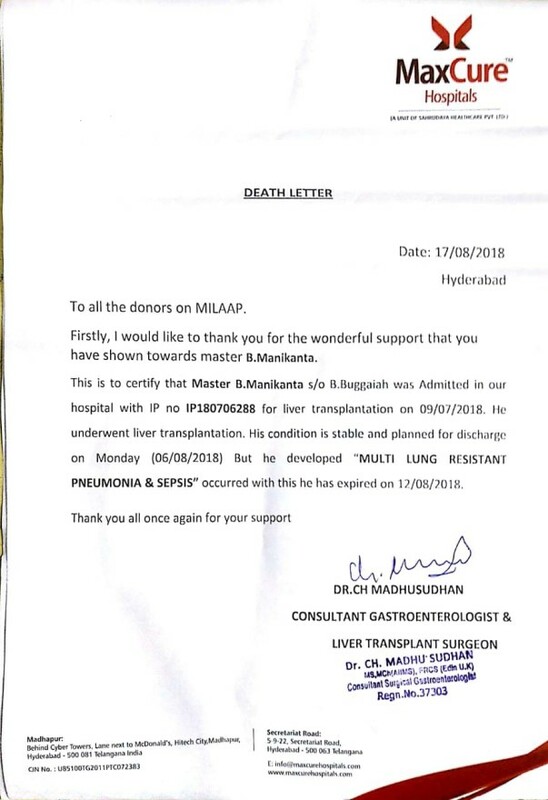 Buggaiah is ready to donate a part of his liver to save Manikanta. Having never gone to school, Chandrakala does not know that it can be done safely. She is scared that she will lose her husband and her child. Despite his family opposing his decision to donate the liver, Buggaiah wishes to donate and save his child's life. But this alone cannot save the child. He needs our support to fund his son's liver transplant. 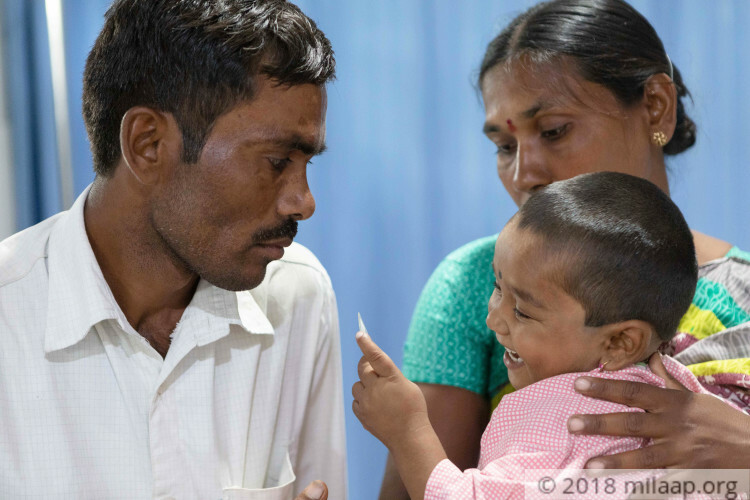 With our help, he can save his 2-year-old son. 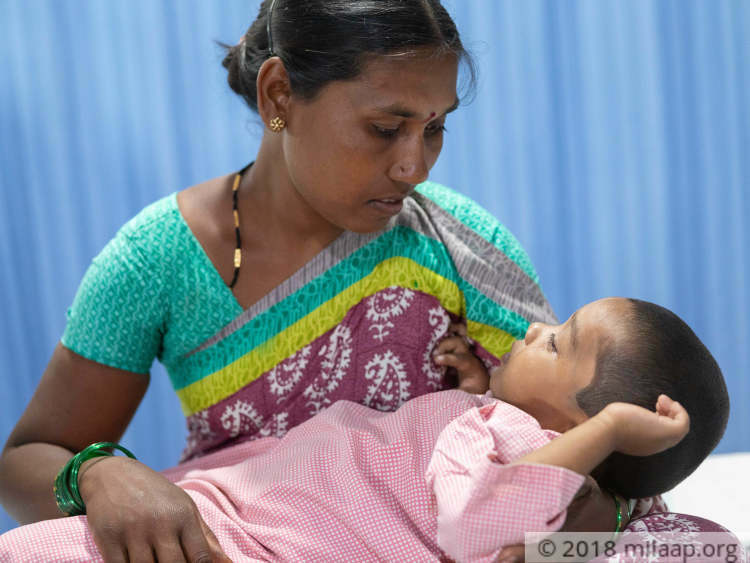 Contribute and save little Manikanta's life. 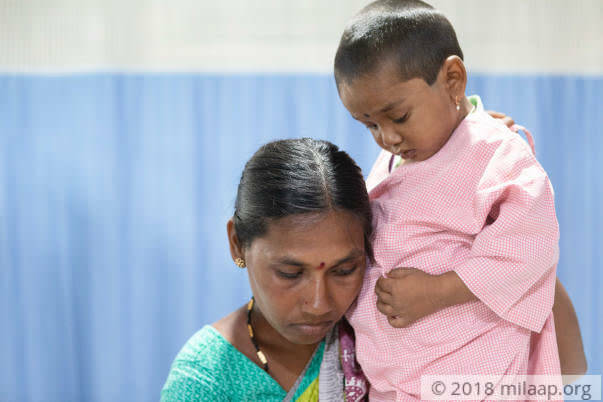 Manikanta was showing good signs of recovery post his transplant but unfortunately he started developing a lot of complications, he had severe pneumonia and also he had lung and kidney infection which kept on getting worse. Doctors tried their best but could not save him. We are grateful to all the donors who contributed towards the campaign. Funds raised have been used to settle down the hospital expenses and help the family. May his soul rest in peace. We thank you once again for your support. We would like to inform you that Manikanta is recovering well and showing a lot of improvement. He is responding to the treatment well. The donor (father) has been discharged from the hospital. We will keep you posted on his health further. 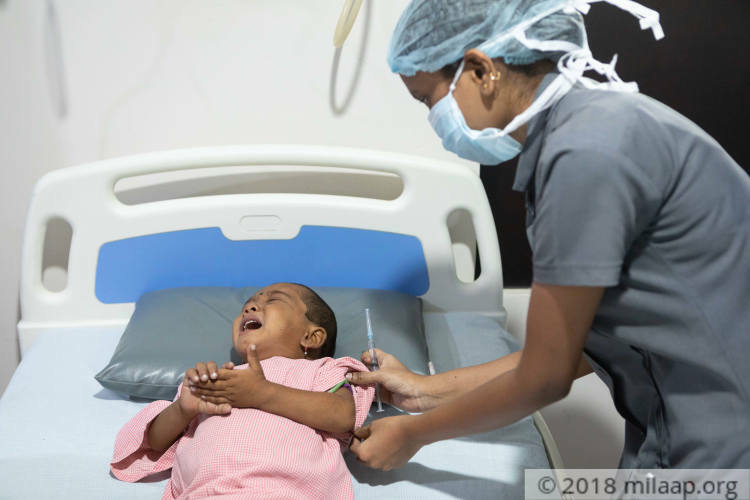 Manikanta has successfully undergone the transplant. He is recovering well and is in the ICU. We will keep you posted further on his progress.